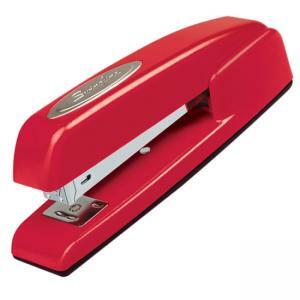 Stapler fastens up to 20 sheets and opens for tacking flexibility. The performance-driven mechanism has an inner rail for long-term stapling integrity. Positive locking latch ensures the confidence and control of a secure stapling position. All-metal, die-cast base offers durability and stability. Design also features a contoured cap and padded rubber bottom for comfortable, convenient handheld stapling. Stapler uses Swingline S.F. 4 Premium Staples.